The chance to step into the world of stories for a moment and re-experience the fantastic stories that Astrid Lindgren has given us is an opportunity for positive experiences that we would like to recommend to everyone. As far as possible, we want to make this chance accessible to everyone, and this is an ongoing and long-term process to which Astrid Lindgren’s World is committed. We work together with Swedish EQUALITY, which has made an accessibility inventory of the park (in Swedish) that you can find here. The terrain in the park is fairly level, and there are lots of open areas. It is approximately 1700 m around the whole park if you follow the main trail. Approx. 50 metres from the entrance there are marked parking spaces for persons with disabilities. Normal parking fees apply of 60 SEK for a full day. The parking fee is payable to our stewards at the car park or in the ticket booths. The admission fee is payable in the ticket booths, which are all adapted for wheelchair users. Disabled guests pay the normal admission price. An accompanying personal carer/assistant is admitted free. If you have a disability that requires a personal carer, the carer gets free admission on presentation of a personal carer certificate. A valid personal carer certificate must be issued with the personal details of both the personal carer and the disabled person. A parent of a child with a disability is not entitled to free admission unless the parent is employed as the personal carer and can show a personal carer certificate. Please contact the ticket booths for more information. Guide dogs in a harness and vest may enter the park at no cost. Guide dogs and service and signal dogs are not welcome in buildings/outdoor restaurant seating areas, with consideration for allergy sufferers. Our Information has a number of portable hearing loops in Swedish that be borrowed if you have impaired hearing. The system is wireless with a receiver and a personal hearing loop that you wear around your neck, or alternatively in a pair of headphones. You then choose on the receiver which theatre setting you want to listen to. If, for example, you want to listen to the performance ‘Sjörövarfabbes jänta’ with Pippi Longstocking in Villekulla Cottage you have to be in that setting to get good reception. 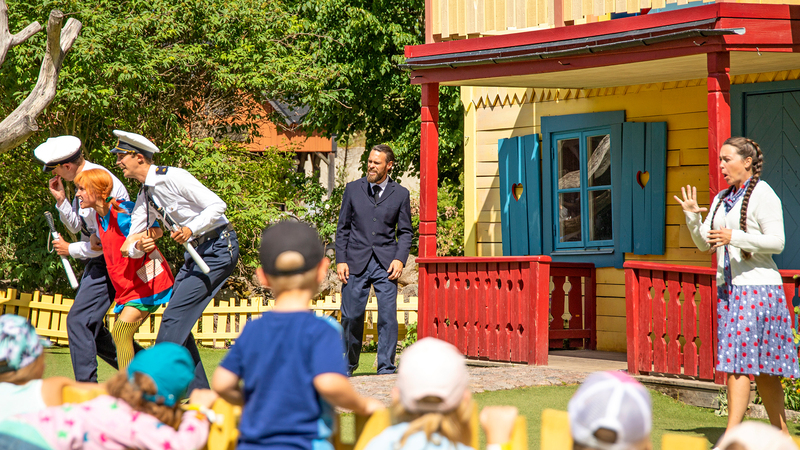 Astrid Lindgren’s World offers a limited number of wheelchairs that guests can borrow. These must be pre-booked the day before the visit by telephone on +46 (0)492-798 00. All our performances have loudspeakers, and there are designated places for wheelchairs by our main settings. If you come in good time before the performances it will be easier for our staff to help you find a good place. In our striving to make the theatre experience accessible to as many people as possible, we have sign language interpreters in some of the performances. They then form part of the performances with costumes, characters and direction, so their participation becomes a natural part of the theatre. The performances are interpreted into sign language according to a predetermined loop so that you can see all the interpreted performances that day. Read here to find out on which dates we have sign language interpretation. All our restaurants are adapted for wheelchairs.